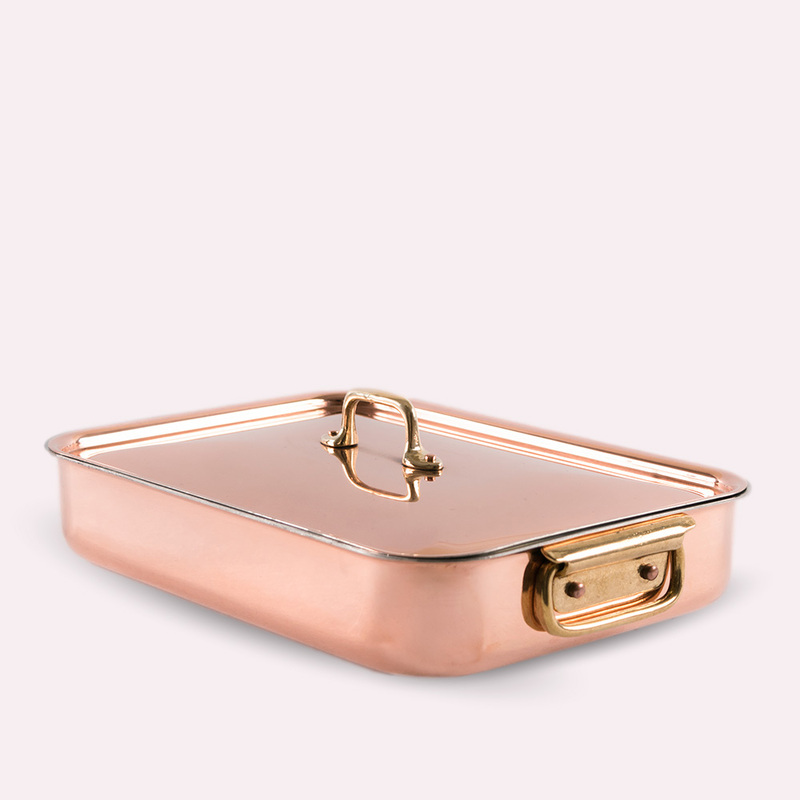 Our rectangular copper roaster "Teglia Retangulare"� comes including the lid and is probably one of the most versatile and most used pieces of cookware in Italy. Whether roasting meat, making a casserole, lasagne/pasticcio or even a dessert or cake - our rectangular copper roaster is the cookware to use. Especially for dishes that fill out the pan such as casseroles, lasagne or pies - even heat distribution not only in the base but also the sides of the cookware is important. Given that our rectangular copper roaster is constructed from one single sheet of copper ensures that absolute even heat distribution is provided. The inside of our "Teglia Rectangulare" copper roaster as well as the lid, is completely lined using 100% pure, non-reactive and renewable tin that is applied to the traditional fire-tinning method. The roasting pan features two pure brass handles on the pan and one pure brass handle on the lid. Each secured with pure copper rivets. 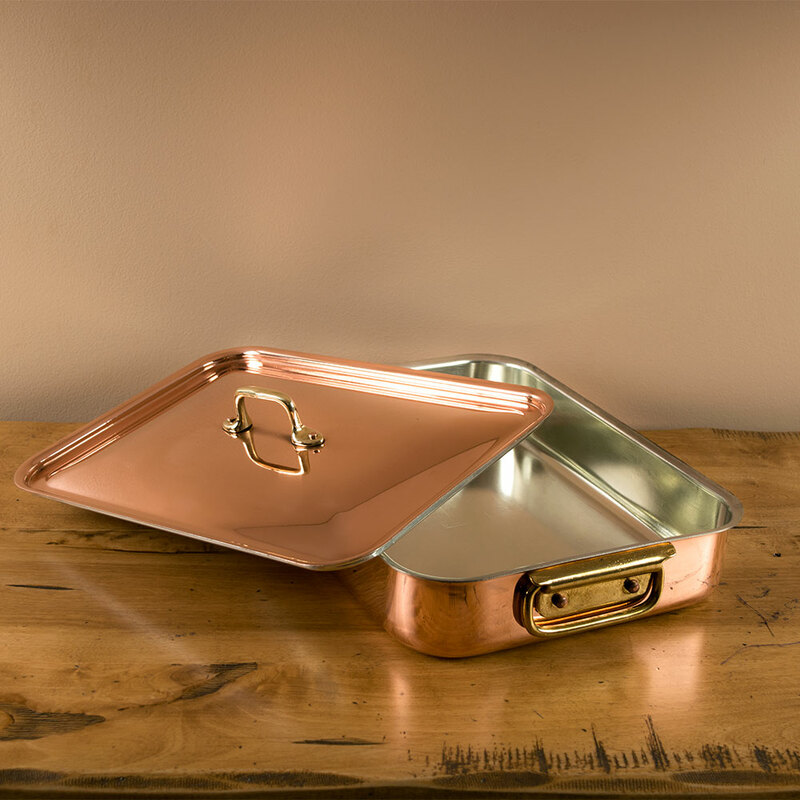 As all of our products, our rectangular copper roasting pan is hand-crafted in the Navarini workshop in northern Italy. 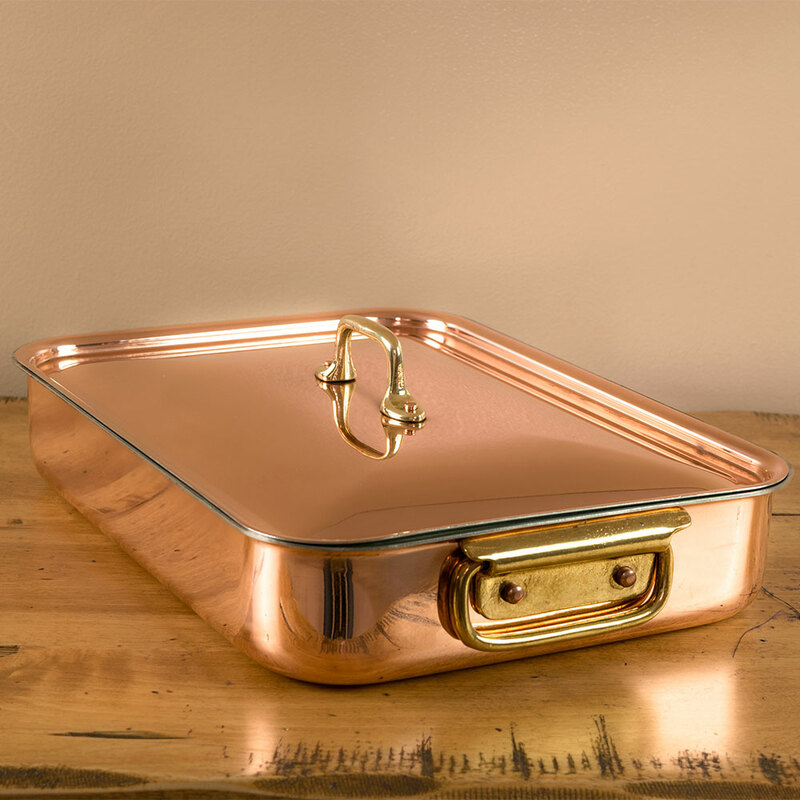 The body, as well as the lid of our copper roaster, is constructed from one single sheet of copper ensuring absolute even heat distribution from the base to the sides of the roasting pan. The 2 handles are made of high-quality brass and secured with pure copper rivets. Another type of materials such as stainless steel or aluminum as well as the way some cookware is constructed might result in air pockets in the material especially the base. Those air pockets would allow heat to concentrate on one spot creating hot spots over time. 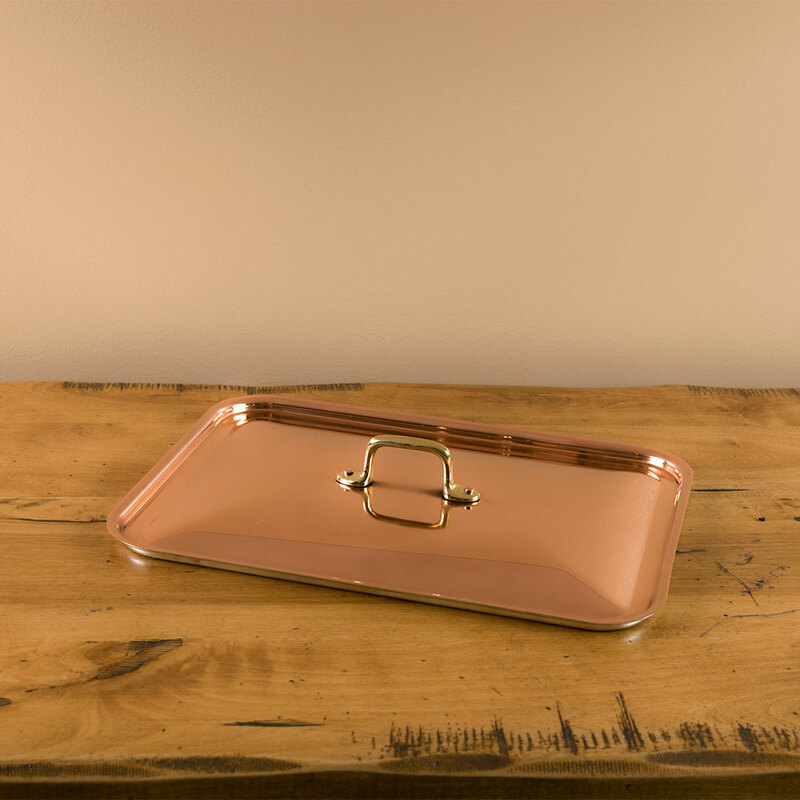 The base of the Navarini rectangular copper roasting pan will never create any hot spots, air pockets or lose any of its superior heat conductivity as it is made out of one sheet of copper. This means that the thermal heat conductivity as well as heat retention will not only be superior to stainless steel or aluminum cookware but will retain its high level of efficiency throughout the lifetime of your Navarini copper cookware. Copper conducts heat twice as fast as aluminum cookware, 5 times faster compared to cast iron and over 25 times faster than stainless steel cookware. This time difference becomes obvious when it comes to heating up or changing the temperature during the cooking process. Changing the temperature on your stove translates into an immediate change in temperature in your copper cookware allowing cooking, brown or braising to perfection. 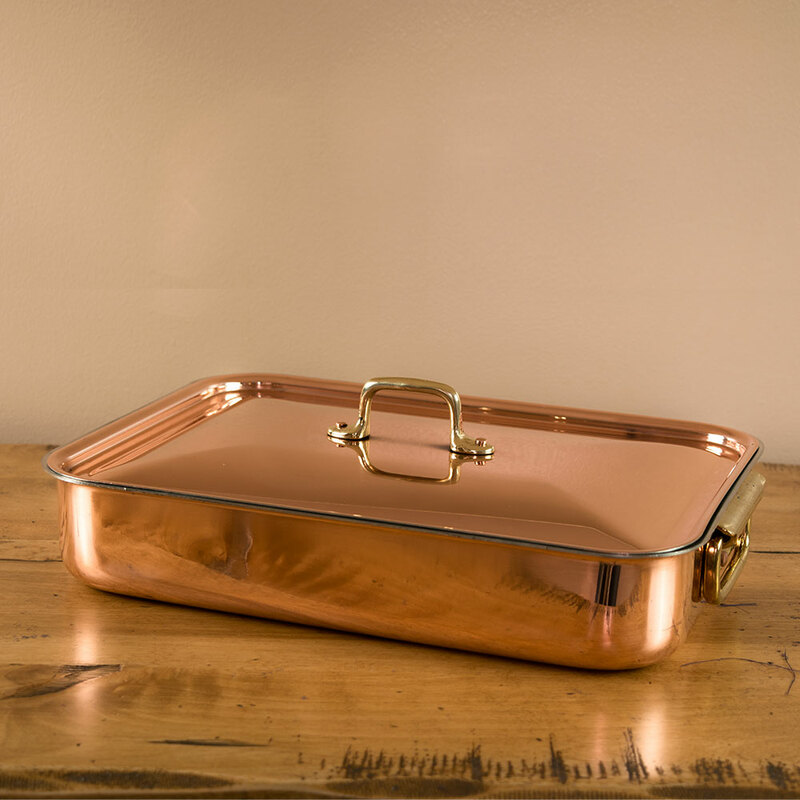 Our rectangular copper roasting pan features brass handles allowing to handle the pan easy and safe. We only use high-quality brass handles on any of our copper products as well as only secure them with pure copper rivets. We only use high quality, 100% pure and non-reactive tin-lining for our copper products as well as applying the lining utilizing the traditional method of fire-tinning. The advantage is that the heat conductivity of the tin-lining corresponds perfectly with the copper. Hence, translates desired changes of cooking temperature immediately to the food allowing much more cooking control and better results. 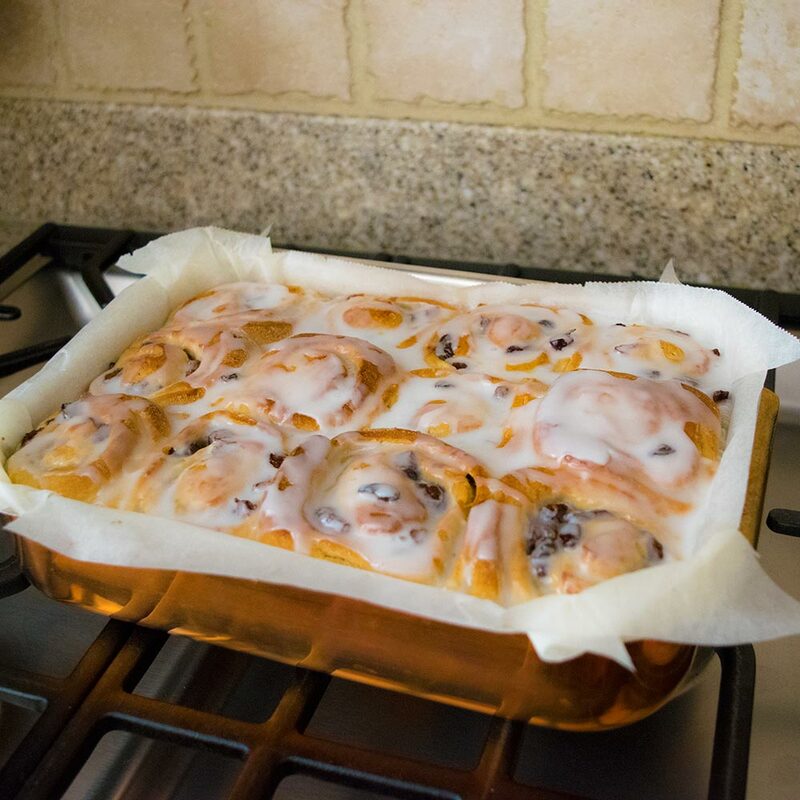 Compared to other coating materials, our tin-lining can easily be renewed as often as desired and your cookware can be handed to the next generation. Our copper cookware including the non-reactive and renewable tin-lining has a high heat tolerance of up to 450� Fahrenheit (230� Celsius). One of the reasons why our copper cookware is preferred by professional chefs around the world. As most of our larger copper products, our copper roasting pan will arrive packed in a beautiful blue "Bottega Navarini"� cloth bag. Not only a fitting bag for our beautiful copper products but already treasured by our customers as a sign of an original Navarini. Crafted by hand in the Navarini family workshop of Ravina, Italy.